St. Lawrence Siro is considered the first founder of Farfa. After arriving in Italy from Syria with a group of monks, he settled first near Spoleto and then moved onto Sabina preaching the Gospel and performing numerous miracles. Torwards the end of his I if e he decided to settle in the valley of the river Farfa and on Mount Acuziano, not far from the ruins of a Roman villa where he started building the Abbey and its Sanctuary and then lived the rest of his life in peace. This first foundation took place around the middle of the 6th century. Soon after it was devastated by the Lombards and the place was abandoned. Torwards the end of the 7th century St.
Thomas da Moriana of Savoia, on his way back from a pilgrimage to the Holy Land, stopped at the foot of Mount Acuziano and after finding the ruins of the old monastery he managed to rebuild it and recuperate the land around it with the support of the Duke of Spoleto. In 705, Pope John XII approved the new monastic structure. From then on Farfa flourished thanks to donations, privileges and exemptions, becoming very powerful Thomas died in 720 and was buried there. The Abbey administration was handed over to highly capable men, who were both worthy and saintly, and who administered the heritage wisely having a vast political experience, so that the Abbey continued to prosper. In this period, one of the important leaders was Abbot Alan, of French origin, the Abbot Probate, who extended the water piping three kilometres longer making it more efficient, and the Abbot Sicardo, who came from a noble family related to the Carolingian Emperors. He had the Carolingian Cathedral built, as well as the Saviour's Oratory. At the end of the 9th century, the Abbey was repeatedly threatened by attacks from Saracens and finally, in 898, after battles lasting seven years, the monks left the monastery and took refuge in Rome, Rieti and Fermo. The Saracens did not destroy the buildings but used them as their headquarters. When they left, the monastery remained abandoned and was occupied by thieves and delinquents who caused a fire which destroyed almost everything. 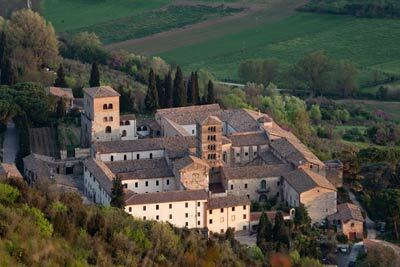 After the year 915, when the Saracens left Italy, the monks returned to the Abbey and, led by Abbot Ratfredo, who died in 936, built it up again and made it flourish. There followed seven years of bad administration and discipline because the Abbey's prestige was gained unlawfully. At last in 997, Ugo became Abbot at the age of twenty-five and started to work laboriously, and because even the most important monasteries were in disastrous conditions, Ugo great initiative for reform in order to gain monastic power all over Europe. S. Odilon, the Abbot in the French monastery, convinced Ugo to introduce reforms also in Farfa. 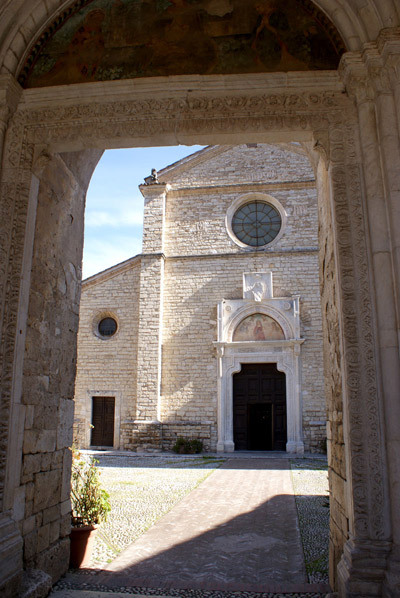 Soon, Farfa flourished again and its patrimony increased considerably even in Abruzzi, Umbria and Marche thus transforming the monastery into a small state with its own army, servants and employees; it had a school, workshops, hostels for pilgrims and a pharmacy. The Abbey building itself gained splendour to the extent that Ugo was able to host Pope Silvestro II, the Emperor Ottone III and Odilone in 999; Henry II in 1022, all in a dignified way Then in 1038, Ugo died. One of his disciples, Berardo, succeeded him as Abbot in 1047. He carried on the work started by Ugo; he battled against Lords and vassals for a number of possessions in the area. Pope Nicholas I visited Farfa twice to re-consecrate the cathedral, in 1059 and 1060. 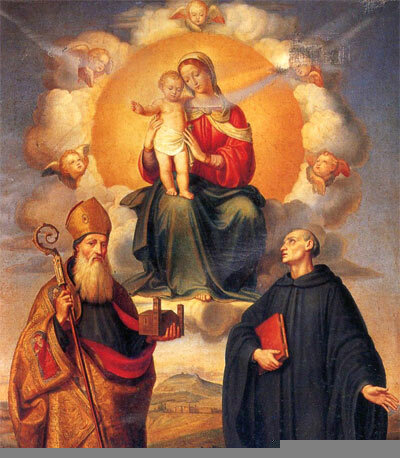 That was the most splendid period for the monastery which hosted within its walls the Abbot Desiderio of Montecassino, St. Pier Damiani and the monk Ildebrando who was to become Pope Gregory VII. Even the Empress Agnes, mother of Henry IV, visited the Abbey in 1072. The Abbot Berardo, in the struggle between the Church and the Empire, had to join forces with the Emperor, and it was only in 1089, just before he died, that he swore loyalty to the Pope in the presence of his monks. During that period a young man from a nearby town came to the monastery and began his studies, both sacred and profane. He began to narrate the history of the monastery by examining the vast material he found kept in the monastery's records: Papal seals, Imperial diplomas and donation documents. In a period of fifty years, Gregory da Catino of Farfa (1062-1133) wrote several works: the Regesto of Farfa, the Chronicon, the Largitory and the Floriger; which preserved records of events concerning Farfa, the Church and the Empire for future generations. Today part of these writings are kept in the Vatican, at the National Gallery in Rome but some have been lost. The continuous struggles between the Church and the Empire put a heavy strain on the Abbey due to attacks by lords from Rome and Sabina on Farfa and this eventually weakened it, together with the undisciplined monastic behaviour and the mismanagement of the Abbots; all that contributed to Farfa's definite decline. Despite the Council of Worms in 1122, which settled the dispute between the Pope and the Empire, and although Farfa was taken over by the Papal authority, things did not improve. In order to put a stop to the decline, which involved almost all the great Abbeys, the Pope came up with the idea of a "COMMEND" . This meant choosing Commendatory Abbots, outsiders who were unaware of monastic rules and were not elected by monks; they were, very often, only interested in the income of the Abbey and in their own profits. As time went on this "COMMEND" was passed on to the other members of the family, who thus inherited the Abbey's patrimony. Farfa had a series of Abbots; the first being the Cardinal Carbone Tomacelli, Pope Bonifacio IX's nephew (1400); who let a group of Teutonic monks enter Farfa that stayed until 1567. There followed the Orsini staying up to early '500 and their memory lies in the present cathedral built and consecrated by them in 1494. Then came the Della Rovere, but the Orsini came back and stayed until 1542; finally it was taken over by the Farnese family. Under the management of Cardinal Alexander Farnese, the monastery joined the Montecassino Congregation (1567). During the next two centuries, in spite of some restorations and new constructions, Farfa lost all importance. Soon after, Napoleon's suppression came in 1798 followed by the Italian one in 1861 the results being that part of the possessions were sold to private citizens. The inheritors of the last owner, Count Volpi, gave the part of the monastery owned by them and some land around it to the monks. In 1920, a group of monks from St. Paul's Outside the Walls in Rome, sent by Abbot Schuster, who later became cardinal and was beatified in 1996, went to live in the old Abbey. In 1928, Farfa became a national monument but only much later did restructuring work to the building take place. There is a great arch over the entrance of the Cathedral The Romanesque portal is ornated with magnificent floral freizes; from this we can see the façade, recently restored and divided by pillars connected on three sides to the internal nave with three doors, the middle one being surmounted with a lunette representing Virgin and Child. As we enter the Cathedral we find an enormous hall of the Renaissance period which also includes several chapels: the Crucifix Chapel, where the ancient and much venerated image of the Madonna of Farfa is kept; the Angel chapel, where we can see the baptistry. All the walls of the Cathedral are richly decorated; on the interior wall of the façade we find the Last Judgement, an oil fresco dating back to 1571. Some parts of the Cathedral and some of the monastery buildings conceal the ruins of the ancient 9th century Carolingian Church. During floor renovations, in 1959, several fragments of precious mosaics were found as well as a small altar with the figure of an abbot. In 1961, during excavations to explore the Carolingian apse, a magnificent 1st or 2nd century D.C. romanesque sarcophagus appeared, decorated with battle scenes. In the exterior part we can see the late 16th century large cloister. A portal leads into the library, which stores several codes and old books saved during the chaotic period when much of the vast literary patrimony was lost. 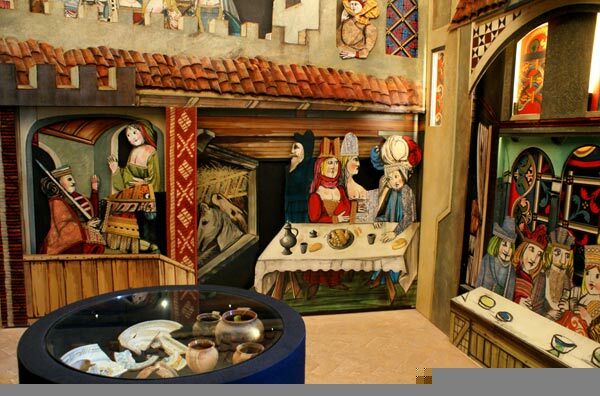 Some rooms have been made into museums and the entrance is from the cioister. The belfry belongs to the original Carolingian buildings. Inside, at the lower end, Abbot Sicardo had an oratory built.